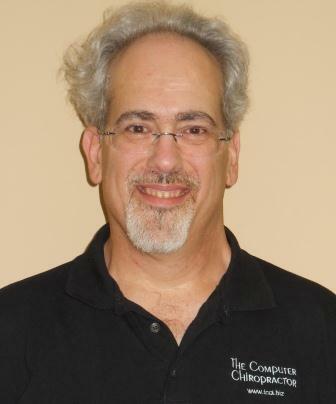 David S. Schwartzman, President of The Computer Chiropractor, Inc., discovered his fascination with computers while an MBA candidate at The American University in 1983. While there he helped the faculty and staff of the Kogod School of Business Administration learn to use their recently installed computer system. Before that he had studied computerized theatrical lighting boards as a lighting designer. He co-founded a technical theatre support company, where he developed his entrepreneurial skills, and used computer systems to produce the company's marketing, contractual and financial documents. During this time David decided to make it his profession to troubleshoot computers and train others in their use. David was senior instructor at the American Computer Institute of Training. He also developed a desktop publishing course for Montgomery College which he taught for 2 years. He was computer training coordinator for the Air Traffic Management Division of the Federal Aviation Administration where he developed and assisted with the implementation of their anti-virus policy. David is committed to helping both companies and individuals become more comfortable, productive and efficient with their computer systems. David also wrote a review of QuickBooks for a guide to small business accounting software in the early 1990's and remains and expert both in QuickBooks and Quicken financial software. In the 2001 David co-founded a company that provided safety product for both the automotive and trucking industries. As its Operations Director and CFO David was responsbile for all financial and billing activities. David's skill with QuickBooks for his companies and Quicken for both himself and his mother's fianances prompted his accountant, Barbara Ames of Barkanic and Ames CPAs, to advise David to add Bookkeeping services for both businesses and for seniors. His additional expertise in maintining both financial, personal medical records for his mother and his keen skill at finding information needed for his mother both while living on her own and then once she moved to an assisted living facility in 2009, convinced David that he had a lot to offer Seniors. After her death in late 2010 David decided to offer Daily Money Manangement Services for Seniors. The Computer Chiropractor was founded in 1994 and incorporated in 1996, to bring these skills to businesses, organizations and individuals. David wants to help you and your business the way he has helped so many others in the past.